When the first astronauts land on Mars in about 20 years, they will have good tools to explore the planet. Using data provided by the High-Resolution Stereo Camera (HRSC) onboard ESA's Mars Express and transformed into 3-D computer models, the first hiking maps of Mars have been produced. These topographic maps, which mix height contours lines and high-resolution images, only cover today the Iani Chaos region at resolutions from 1:200 000 down to 1:50 000. But the scientists who created these first maps want now to produce more than 10,000 maps covering the whole Red planet. But why these German scientists have decided to start with this region of Mars? One of the reasons is that NASA has considered it as a possible landing site for its Mars Science Laboratory, a mission which will take place in 2009. The second one is because of its geological features. 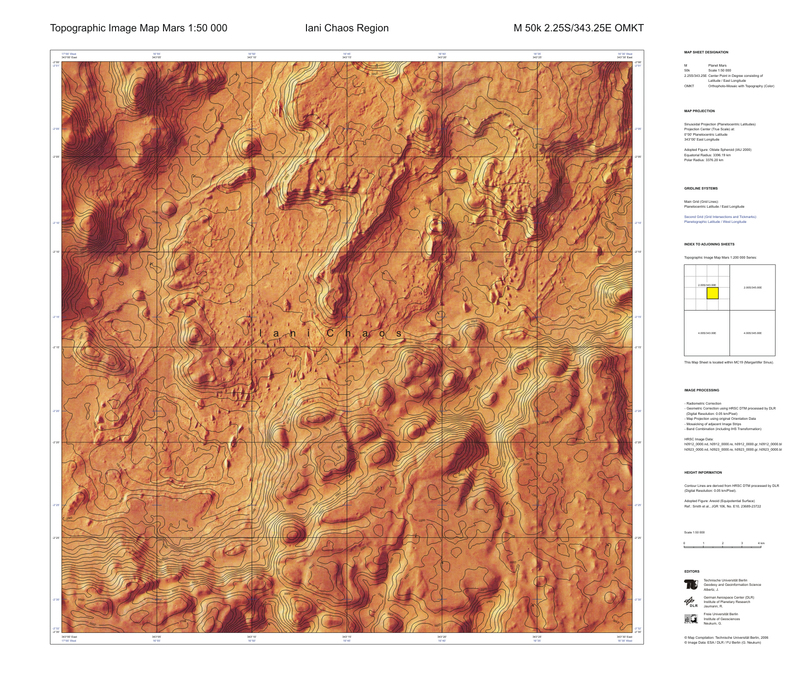 Below is a topographic map of the Iani Chaos region on Mars at a scale of 1:50 000. "The contour lines are now only 50 meters apart. At these smaller scales, more textural details of the surface can be recognised. The data were obtained by the High Resolution Stereo camera on board ESA's Mars Express on 5, 8 and 11 October 2004 (during orbits 0912, 0923 and 0934 of Mars Express)." (Credits: Map Compilation: Technische Universität Berlin, 2006; Image Data: ESA / DLR / FU Berlin (G. Neukum)). Here is a link to larger version of this map (2.18 MB). And here is a link to several other maps at various scales. The ESA's news release gives more details about the terrain which exhibits some chaotic patterns. These 'islands' of rocks are likely all that remains of a previous surface of Mars. The areas in between the islands collapsed when cavities formed below the surface. Initially these cavities may have been supported by the presence of ice, which melted due to volcanic heat. As the water flowed out into Ares Vallis, towards the northern lowlands of Mars, the landscape collapsed and formed the Iani Chaos region we see today. The contour lines help the eye to understand the morphology of the surface shown in the images. On most of the maps, each line represents a difference of 250 metres in height. The maps also display the names of geographical features and the lines of Martian longitude and latitude. In an entry posted on February 12, 2007, "Hiking maps of Mars," the New Scientist Space Blog gives additional details on the Iani Chaos region. The canyons date back to a much more active period in Mars's history billions of years ago. Scientists suspect that at this time, underground pockets of ice suddenly melted, perhaps because of volcanic activity. This caused huge sections of unsupported rock to collapse, forming the canyons visible in Iani Chaos today. The maps were made with data from the European Space Agency's Mars Express spacecraft. Each contour line represents a height difference of 250 metres. The spacecraft's High-Resolution Stereo Camera (HRSC) maps the planet in 3D by taking images of a given patch of the surface from different angles. You can see a virtual flyover of Iani Chaos made with HRSC data. Even if these maps will not be useful years before years, they might be used before to study Mars. And, who knows, you might be one of the first to use them.